The theme for this PACC conference was 'Exploring Life as a Parent Carer' and was facilitated by Hannah Prior from local arts and culture organisation 'Ignition' Hannah led the parent carers who joined us in a number of exercises that looked at the challenges of being a parent carer and some of the things that can help. She shared a 'life wheel' to support identifying priorities and parent carers worked in small groups to create pictures showing how it felt to be a parent carer. 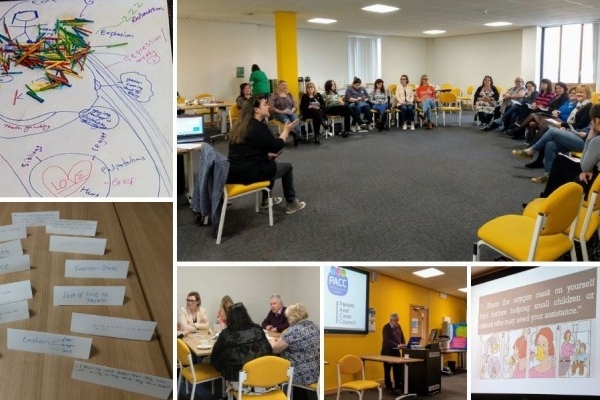 This arts based approach is a different method to explore issues relating to parent carers but PACC believe that it is important to offer a range of activity styles at our events. The presentations from the day, the chairs report, and feedback summaries from the event are available below.